Looking for an non-toxic way to preserve cells and tissues at 2-8°C? Choose ROKEPIE, the best hypothermic preservation solution on the market. 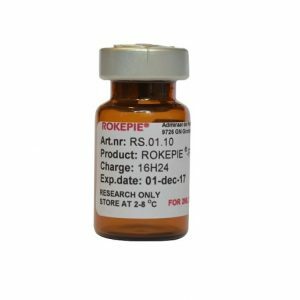 Extend the transportation and storage time of cells and tissues by simply adding ROKEPIE to your medium of choice. ROKEPIE will be delivered in a lyophilized (freeze-dried) formulation of 2ml which can be used to make 50-200ml culture medium depending on cell density and cell line in question. We have this item on stock and we can ship it to you immediately. Worldwide shipping!